The Middlesex Town Forest is 403 acres and ranges from approximately 1,050 to 2,250 feet in elevation. The Property is situated on the east side of Notch Road, a Class IV road that abuts the Town Forest. Because of the Property’s proximity to other public and private conserved land parcels, including the State of Vermont’s Middlesex Notch Wildlife Management Area and the Putnam State Forest, the Middlesex Town Forest is of important conservation value. The Town Forest increases habitat connectivity between the Interstate 89 corridor and Mt. Elmore. The Worcester Range is important forest land for wildlife habitat and natural resource conservation, recreational use, and scenic beauty. The Property has been privately owned as farm and forest land since Middlesex was settled. The residents of Middlesex and surrounding towns have traditionally used the Property for winter and summer recreation with permission from previous owners or their agents. 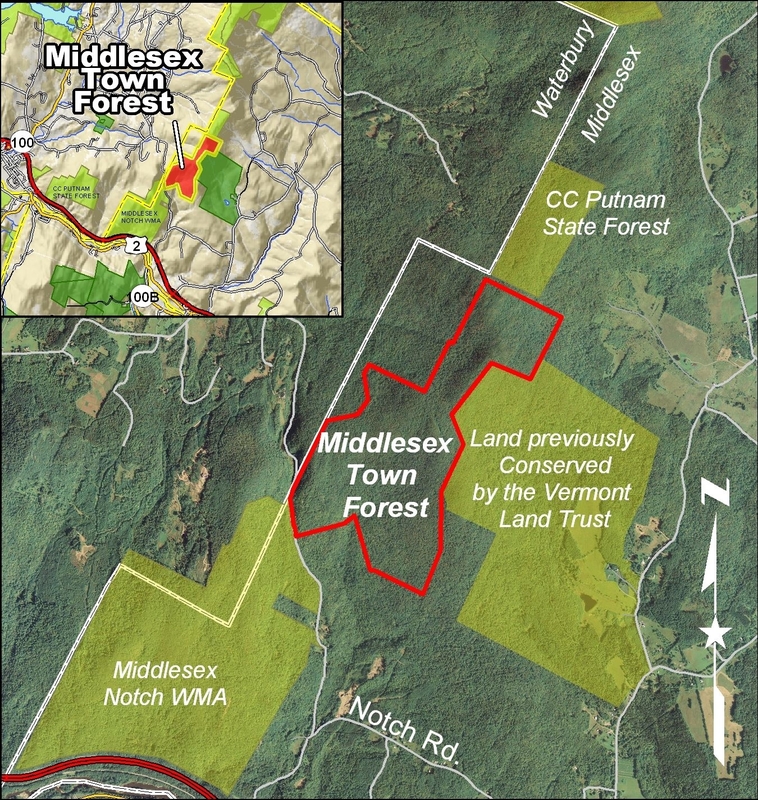 The Property was offered to Vermont Land Trust (VLT) for permanent conservation, and with the help of both public and private donations, was acquired and subsequently conveyed to the Town of Middlesex in January 2009. Thanks to an effort led by the Vermont Land Trust, the Town bought the 403-acre property from Cynthia Steed and Eleanor Ott in January 2009. The $324,000 purchase was funded by the Vermont Housing an dConservation Board ($271,000), the Vermont River Conservancy ($6,000), the Middlesex Conservation Fund ($18,610) and more than 90 private donors ($28,153). Please note this section of the website is under construction. To learn more about the Town Forest click here!